Unfortunately the "Free Lifescript Membership & Football Fan Pack" offer is no longer available. Lifescript Advantage is a program designed to promote healthy living. Membership is free and comes with exclusive privileges like free samples, coupons, and tips for a top notch lifestyle. Sign up now for your free football fan pack and a chance for great savings. Every year, fans follow their favorite teams down the long, tough road to the Super Bowl. The eight billion dollar industry is built on fans' love for their teams, making the NFL a truly American institution. Unlike most professional sports today, no matter where you live in the country, your team has an equal chance of winning the Super Bowl. Although two-thirds of all National Football League revenue comes from television contracts, your online purchases also make an impact. Since all television, licensed apparel, and sponsorship money is distributed equally amongst the teams, the result is a parity that guarantees the level playing field that makes football the great American sport. Considering that football lends itself easily to point spreads, over-unders, box pools, and fantasy football leagues, gambling on football has also become a part of American cultural fabric. Whether you're rooting for the hard partying Saints, the underdog Chiefs, or the villainous Raiders, you're participating in one of the most exciting, most watched sports in the United States. From savings on heavy game day food alternatives to protein bars that will help you get in shape for your own team's football season, Lifescript Advantage has everything your household needs to support a healthy body. 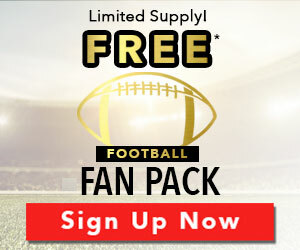 Sign up for free for your football fan pack, while supplies last.